Phil Grimaldi, Director of Research at OpenStax presented research on the impact that OER access has on learning. 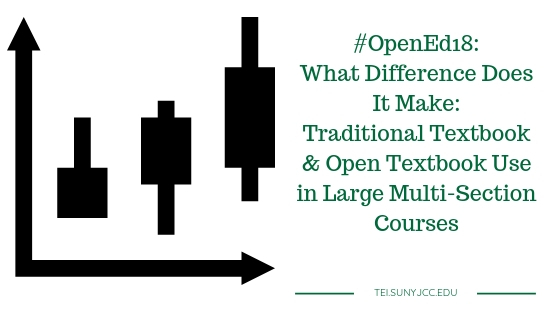 The study compared OER versus non-OER studies. Jacob Jenkins, Associate Professor & Campus Coordinator for CSU’s Affordable Learning Solutions and Jaime Hannans, Associate Professor, Nursing both from California State University Channel Islands presented on lessons learned as they created CSU’s first Z-majors. Regina Gong, OER Project Manager at Lansing Community College, gave a research presentation on the difference between courses using traditional commercial textbooks and open textbooks across four variables (cost, outcomes, usage, and perception). Ann Fiddler, Andrew McKinney, and Laura Murray form various institutions in the CUNY system discussed the challenges and opportunities for designating their Zero Textbook Cost (ZTC) courses in their course catalog.